A PC for Your Wrist? 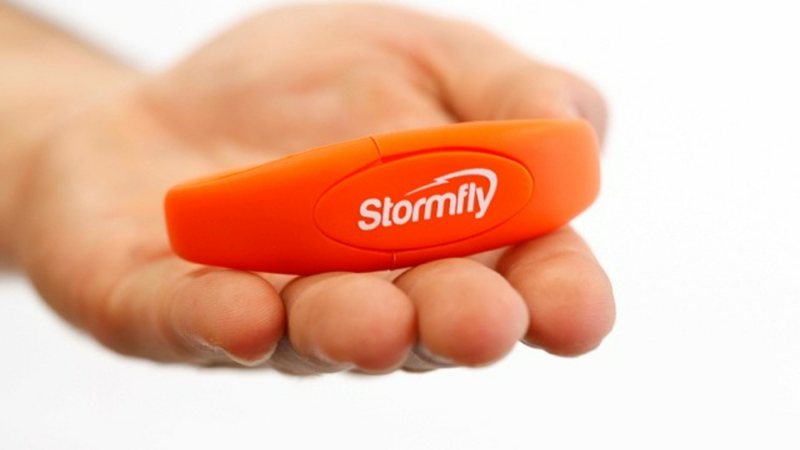 The StormFly Wristband is more than your average flash drive. It is a super, fast storage device with a Linux Operating System that is bootable on most PCs and Macs. You can take your operating system and critical files with you, wherever you go and use it on any pc or Mac that is available. No need to carry a heavy laptop. Just your StormFly Wristband. The process is pretty simple; plug in, reboot the computer and redirect to run from your StormFly. StormFly comes with cloud backup services, so if it is lost or stolen, you can get a new one with all your data and apps in just 24 hours. You can choose to use the StormFly just like a regular USB drive. Users will need to enter a password to access any of your stored information. The creators of StormFly plan to market to schools and families with shared desktops. Kids often download things they shouldn’t or change the settings and can royally mess up your desktop. No more. The StormFly user never has access to host computer’s OS. Now Computing has a KicksStarter campaign going to raise funds to bring this fun new device to market. You can pre-order a StormFly for $59. Would you use a StormFly? What do you think of using them in schools?